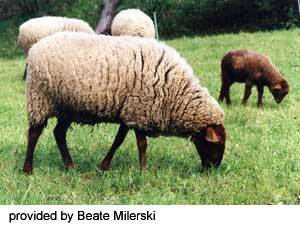 In the 19th century this landrace sheep populated the European hilly ranges abundantly. These red fox-colored sheep could be found under names that indicated their color or living area, such as Golden Fox, Eisfelder Fox Sheep, Eifeler Sheep, Ardenais Solognotes, Rousse Tetes. In the beginning of the 20th century, 60% of the sheep in the German Coburg area were of this landrace with the red fox-colored heads, but by World War II they were nearly extinct. It took Otto Stritzel, a breeder and weaver from the Fichtelgebirge (a hilly range in Bavaria) to publicize the favorable characteristics of the Fuchsschaf which laid the foundation for its continued existence. Since 1966 this German breed has been officially recognized and it has been presented at shows which has helped to spread its popularity. 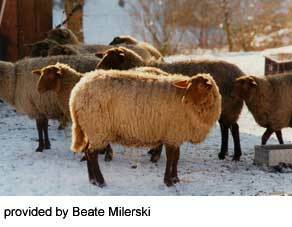 Only two registered breeders in the German state of Bavaria, with about 100 ewes, and one large breeder in Baden-Baden existed in the early 1980’s, whereas at the end of 1993, 34 registered breeders lived in Bavaria with their 1238 ewes and 51 breeding rams. Now breeders from all over Germany have added the Fuchsschaf to their breeding stock. The Fuchsschaf flocks are employed for landscape preservation. The Coburger Fuchsschaf is frugal, hardy, and prolific. Longevity and non- fussiness of food make it a perfect choice for keeping on rough hilly ranges. It is possible to breed them three times in two years. In 1982 , the Bavarian Breeder’s Association decided on the following weights: Rams: 80 to 100 kg, yearling rams: 50-60 kg, ewes: 60- 75 kg. Both sexes are polled, head and legs are either both golden or both red-brown and free of wool, its ears are broad and long. The small noble head has a slight Roman nose profile. The specialty of the Coburger Fuchsschaf is its long wool. 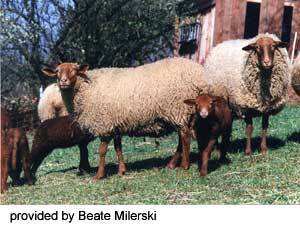 Lambs are born with a dark red-brown fleece that lightens at age 6- 12 months. The resulting Golden fleece (white with a red-brown or golden tint) contains more or less dark kempy hair, which impart an appealing color play in the yarn and finished product. Fiber artists love to spin, weave and felt this interesting wool with a fiber diameter of 33- 36 microns.. Rams produce 4-5 kg of wool, ewes grow 3-4 kg of wool a year. Lambs and grown sheep are sold mostly through direct marketing for their delicious, tender, and low-fat, meat with a venison taste. Nowadays breeders have discovered the importance of this old, robust landrace and the Coburg Fuchs will hopefully coexist next to the meat breeds. Although the number of Coburger Fuchs sheep has increased considerably in the past years, it is still on the list of endangered sheep breeds.